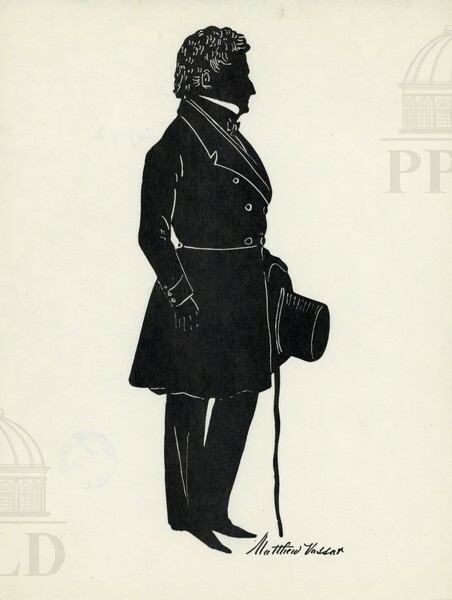 Cut silhouette of Matthew Vassar - founder of Vassar College. Full body silhouette, cut in Saratoga, N.Y.. Gift from the Centennial Dinner for Vassar College; arranged by the Chamber of Commerce (May 1961). Auguste Edouart, “Vassar, Matthew,” Main & Market: Sights and Sounds of the Queen City and Beyond, accessed April 24, 2019, http://mainandmarket.poklib.org/items/show/3438.